Literary Reviews | Grant Gillespie | Grant Gillespie, actor, novelist and screenwriter. Grant Gillespie recalls being gripped by Animal Farm on Spanish childhood holiday – and almost missing the meeting that changed his life. Grant Gillespie is a novelist, screenwriter and actor. 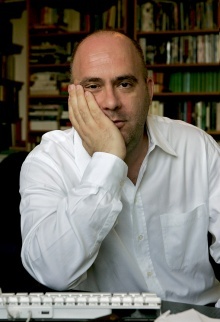 His debut novel, The Cuckoo Boy, was published in 2010. Here, he recalls his father reading Orwell to him on a family holiday and arriving late – and unwashed – to the meeting that changed his life. “The first book that really knocked my school socks off was Animal Farm. I know that makes me sound preposterously precocious, but in my defence, strictly speaking I didn’t read it. It was my father who read it to me. “The memory is very vivid… I was between eight and 10 and my mother, father and I were in Spain – we spent most of my school holidays there because my parents spoke the language and loved the culture. Every day, they’d insist that if I was to be permitted to stay up late then I had to take an afternoon siesta. 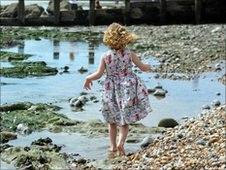 “Naturally, I resented this with every atom of my being as the sun was still shining and all the other children seemed to be free to splash about in the sea unfettered, but that was ‘the rule’. In order to settle me off to sleep, my father would read to me and, that particular year, the book on hand was George Orwell’s classic. “From the moment it began, I was gripped. I remember laughing heartily when the pigeons crapped on the farmers’ heads (though my father had to explain ‘shat’ to me) and weeping when poor Boxer worked until he collapsed and was sent away for slaughter (my father also had to explain ‘knacker’s yard’). “Someone once said to me, ‘write three novels and the third one will get published’. I didn’t believe them. I didn’t want to believe them. I knew all I had to do was write one novel. It would then be ripped from my hands by Bloomsbury, Faber or Penguin and delivered up to the eagerly awaiting hands of an erudite, international elite readership. “While at university, I began what turned out to be a profoundly pretentious novel. Then, on graduating, I wrote a profoundly superficial novel. I followed these with my third novel, The Cuckoo Boy, and that’s the one that was published. “A publisher, Lucy Owen, invited me to meet her for a coffee. I knew that the publishing house created journals and I assumed Lucy was going to ask me to contribute to one of them in the form of a short story. There was some muddle over what time we were to meet – my fault, of course. “Without even contemplating washing, I threw on a crumpled velvet jacket, and half-ran (I never fully run) to Bloomsbury, while licking my hand and trying to flatten my hedge-backwards hair. Lucy was very magnanimous. She told me to ‘breathe’ and ordered me a coffee. I asked if I could breathe outside for a moment – through a cigarette – and she said I could. “When I finally sat down, Lucy said the unexpected words: ‘I hope you don’t mind but someone passed us your novel and we’d like to publish it.’ Without exaggeration, I practically fell from my chair. I then immediately asked if I could have another cigarette, a wish I was granted. As I paced Woburn Walk, I was dizzy with nicotine and excitement in equal measures. “It was a real ‘this never happens to me, but it has happened to me’ moment and I’ll never forget it. The months that followed were a dream literally – and literarily – come true. I held the book in my hands, just for a few seconds, the first time, but I was nearly sick in my mouth with joy. 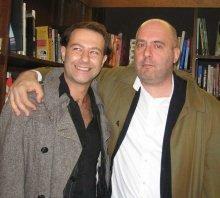 “I had a fabulous launch party where I read alongside my heroes Hanif Kureishi and DBC Pierre. I saw my book in Waterstones, but didn’t linger because it would have felt too pompous. Then I had a flurry of amazing reviews. 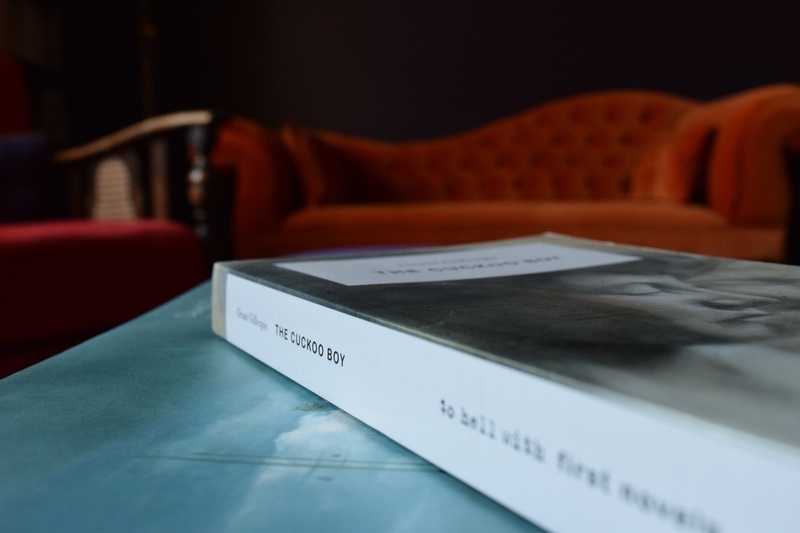 I had heard of “The Cuckoo Boy” by Grant Gillespie through The Novel Cure and it was a part of my reading challenge – The Novel Cure Reading Challenge. It is a cure for adoption and yet somewhere down the line, there is to more to the book than what meets the eye. It is a story of a dysfunctional couple – Sandra and Kenneth adopting Baby James and how their world spins out of control thereon. There is an imaginary friend David, who enters the scene and very soon there is a real friend David who also enters the picture, thus making the book and the plot, slightly chillier. The book is seen through the eyes of James and his parents. The emotional expectations are almost the centrepiece of this novel. It is about worlds colliding – the real and the imaginary, which makes the book what it is – juicier and scarier. There are moments in the book, when you look back on your shoulder to see if there is anything going on at all. Grant does not give all the answers to readers. He makes them hang to turn the pages and find out more. It is also in so many ways a whodunit, given the situations and the revenge exacting nature of James. The book is tricky – one starts to wonder if the parents are wrong or the child is wrong, till the puzzle fits itself. The story is tight and yet sometimes loses out on the overall communication of the plot. Having said that, I would still give it a five, because of the sheer force of writing. The dread surrounding the book is eerie and the atmosphere is only full of macabre. A read for a dark winter’s night, because this is exactly the kind of book you want to take to bed. This book is from one of my favourite publishers of the year, To Hell With Books. They are a small press that is based quite near SMH HQ in Euston and they picked up the amazing Grant Gillespie’s debut and did well with it. It is another ‘disturbed childhood’ book. The unique thing about this book is that Gillespie is able to step inside the head of the main character, his mother and his father and make you really feel like he was there. It is almost as if it was his childhood that went so badly wrong. It is a story of ‘kids being cruel’, parental love gone wrong and a few deaths. FICTION has always held up the mob as an example of corrupt society. Over the centuries novels such as Tobias Smollet’s The Expedition of Humphry Clinker on to Mark Twain’s Huck Finn and on again to Cormac McCarthy have counter-pointed the amorphous mass with a protagonist who sees things differently. Gillespie’s debut novel from this quirky publisher relates the extraordinary story of an adopted boy, James, who ends up facing such a mob. His adopted parents, Sandra and Kenneth, bring James into their life at a very young age. But things are terribly wrong from the outset and get complicated when the toddler develops an imaginary friend, David. Nothing too worrying here as many children have these semi- spectral buddies. But James’ is ever-present, almost a projection of another personality. David is wilful and bold where James is careful and needy. This imagined friend stays with James as he grows past puberty. Meanwhile, Sandra and Kenneth discover to their astonishment that she is pregnant, having thought she was infertile. Mother dotes over the new child; she is everything James isn’t, and she is really ‘hers’. A nightmare ensues with the death of the baby, with James, of course, implicated. Another death follows as the boy’s grandfather chokes on a fish bone. David stands by, watching him die. David develops friendships with some local children and forms a gang. However, when he is pushed into a pit of rotting pig carcasses he takes horrific revenge torturing one boy to death. With strong parallels to Golding’s Lord of the Flies which demonstrated the savage nature of humanity detached from civilisation, Gillespie’s superb debut avers that such isolation is possible within our own societies and that the consequences can be tragic. In this case, the mob rules. My publisher Lucy Owen at To Hell With e-mailed me this excellent piece (by Dr. Karen Majors – Community Psychology Service, Barking and Dagenham) about imaginary friends, as I had one myself and the subject features heavily in The Cuckoo Boy. “It used to be thought that children with imaginary friends were in the minority. It has sometimes been assumed that children had imaginary friends because they were lonely and lacked real friends. Perhaps this is why some parents and others may show concern when a child has an imaginary friend, particularly once they have started school, and older children and adolescents tend to keep their imaginary friends a secret. Imaginary companions or friends have certainly been a misunderstood phenomenon. There has been surprisingly little research about imaginary friends. Consequently there has been little information about how many children have imaginary friends, what the imaginary friends are like and why children have them. Recent research has been providing some surprising answers to some of these questions. Firstly, there is now clear evidence that imaginary friends are a common feature in childhood development. It is now recognised that imaginary friends are often part of normal development. A good example comes from the United States, where pre-school children and their parents took part in a 2004 study looking at different aspects of development, including imaginary companions. The children were then followed up after starting school, when they were aged seven years. The researchers were very surprised to find that 65% of children up to age seven currently or previously had had imaginary friends. Like other research, imaginary friends which were based on a special toy were included. In a study in the United Kingdom, 1,800 children completed a questionnaire about imaginary friends. Forty six per cent of them reported past or current imaginary friends, including nine per cent of 12-year-olds. There is a need for more research about which children have imaginary friends and why they have them. We do know that children with imaginary friends are not a homogeneous group. Certainly, it is now recognised that imaginary friends are often part of normal development. Young children with imaginary friends are often described as sociable, imaginative children who love stories and pretend play. They enjoy playing with friends and at times when friends are not available, they call on their imaginary friends for entertainment. Children also call on their imaginary friends when they feel upset about something that has happened or about what some one has said to them. Some children will talk to their friend about the problem, others will play with their imaginary friend, which takes their mind off the problem and the unhappy feelings disappear. We also know that some children who have endured traumatic life events may also draw on their imaginary companions for support. The imaginary friends of older children and adolescents are a much more private affair. Often unknown to parents and others, although a best friend might know about their existence. Older children are aware that parents, friends and others may show disapproval. As part of my research I interviewed school aged children aged five to eleven years and the parents of the younger children. All the children said that their imaginary friends were important and why they were special to them. I have concluded that imaginary friends are often a very positive feature in a child’s life. They provide fun, entertainment, adventures and games. They are often good, kind and helpful friends, good at listening and always available. Some imaginary friends are not always co-operative or friendly, this however seems to make them more real and interesting to the child and sometimes helps them to express their feelings when there has been a problem. This was a small study and we do need more research.